In over 35 years of involvement in ministry to professional baseball players I've met many classy individuals and a few miserable coots. 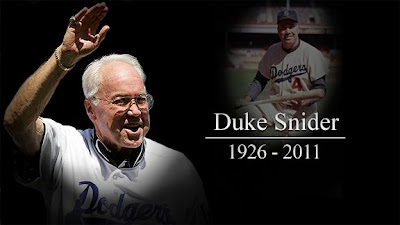 One of the finest, kindest and classiest gentlemen I've met was Duke Snider who fashioned a Hall of Fame career with the Brooklyn Dodgers and then the Los Angeles Dodgers following their relocation to the west coast. Snider was a broadcaster with the Montreal Expos following his playing career and I had many conversations in the press box with this fine man. Duke passed away from an undisclosed illness this weekend to a better land where there are no tears or sorrows. Duke often spoke to me of his abiding faith in Jesus Christ and was such an encouragement to me when I served as chapel leader for the Expos. Our loss is heaven's gain. Rest in eternal peace, Duke! A great player and a great human being!